About the amazing properties of sea urchins people know for a long time, but it turns out far not revealed all the secrets of ancient marine animals. Scientists from many countries are studying these echinoderms, common in almost all world oceans and seas except the Caspian, Black and Baltic. There are about 800 species of sea urchins, they are correct (round and almost perfectly symmetric) and irregular (more flat). The needles of sea urchins, which they got its name vary from 1-2 to 25-30 cm. In Primorsky Krai in our coastal waters is most common grey sea urchin Strongylocentrotus intermedius, this kind of urchins in large quantities is found in shallow water from the southern part of the Okhotsk sea to the sea of Japan. Domestic experts from the far East scientific centers successfully studying biologically active substances (BAS), which is extremely rich in sea urchins. 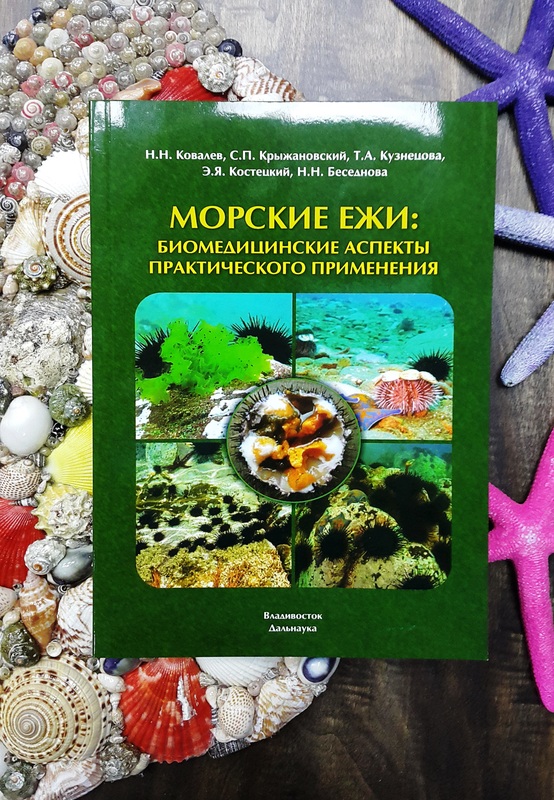 The results of the studies summarized in the recent book "Sea urchins: biomedical aspects of practical application". The creation of the book involved the author's collective under the leadership of N. N. Kovaleva, doctor of biological Sciences, Professor of the Department "Biochemistry, Microbiology and biotechnology" of the school of natural Sciences far Eastern Federal University. Of course, most of the book is intended for specialists, but it contains a lot of interesting information available to all. The value of the new scientific publication that extensive materials about the structure and composition of the body of sea urchins coexist with the description dietary Supplements and functional foods, developed under the supervision and with the participation of the authors. The book also includes material on clinical trials generated funds. Briefly describe the main contents of the publication. It's the gonads of female and male sea urchin. Sea urchins do not lose their fertility at any age, and show no signs of aging. Many species of hedgehogs are virtually immortal, science knows instances gushie to 200 years. Hedgehogs do not die from old age or disease and from predators or getting into the networks of fishermen. The gonads of sea urchins have long been a delicacy in Asian cuisine, especially in Japan, and from ancient times used for raising vitality and treatment of many diseases. Exploring numerous valuable biologically active substances contained in the gonads of sea urchins, the authors developed an effective means for rejuvenating and strengthening health. Eggs of sea urchins (H) contains a large set of biologically active substances, including proteins and lipids. Gonad protein contains 17 amino acids, including arginine, glycine, tyrosine, taurine and other valuable components. In the eggs are also sulfated polysaccharides, vitamins A, D, E, B1, B2, B12, K, PP. It should be noted that the content of vitamin A in eggs of the sea urchin exceeds 20 times the amount of the ginseng roots. Caviar of sea urchins contain a physiologically important macro-elements: iron, zinc, potassium, sodium, calcium, and trace elements: copper, magnesium, chromium, manganese, cobalt and iodine. The amount of trace elements in tissues and eggs of the sea urchin 50-100 times higher than in terrestrial animals. Lipid complex caviar includes saturated, monounsaturated and polyunsaturated fatty acids that have a positive impact on the level of triglycerides, reducing the risk of diseases of the cardiovascular system. Omega-3 fatty acids help rheumatoid arthritis, diabetes of the 2nd type, depression and other diseases. Sea urchin ROE has a great antioxidant potential. It is also proven the anti-inflammatory action. Antimicrobial (antibacterial and antifungal) effect HAVE been actively studied and may be the basis for the development of natural antibiotics. Part of the IMA are substances that increase sexual activity in men and normalizing the production of testosterone. The IMA is used in cosmetics for the manufacture of face masks and anti-cellulite wraps. Useful properties of H are used in many Supplements, one of the most effective – BUSINESS YOUTH. Is a modern design with high digestibility and biological activity. The IMA processed using the advanced technology of enzymatic hydrolysis in the composition of the EXTRA YOUTH to achieve a synergistic effect included uliginosa calcium and rose hips as a source of vitamin C and to enhance the anti-inflammatory effect. The combination of all these components has a positive effect on the musculoskeletal system, is the prevention of osteoporosis, inflammatory diseases of cartilage, reduces brittle nails and strengthen hair. The hormonal age-related changes that begin in the female body already 35-38 years, gradually exacerbated chronic illness, disrupted endocrine and cardiovascular system, metabolism slows down, you receive extra weight. Clinical study the effect of the EXTRA YOUTH was held in groupees 101 women aged 39-77 years. They took EM in for 30 days. Before and after the study, subjects filled out a questionnaire, which was recorded on 15 health indicators, positive dynamics was recorded for all indicators, except for the appetite that has not changed during the study. Another study concerned the quality of sleep. Involved 24 women who complained of poor sleep and frequent awakenings, and insufficient sleep duration the Reception UM the beneficial effect on sleep quality, improved mood, physical and mental activity. A separate study was devoted to the improvement of the skin in atopic dermatitis and allergic disease, accompanied by dryness and itching of the skin. The same symptoms often occur in many women during menopause and during menopause. As a result, women taking UM, there was significant improvement in the level of hydration, and the effect persisted for a long time after the end of the reception of the complex. The authors are leading scientists, they are continuing their investigation of the rich resources of the seas and oceans, has a great opportunity to create more efficient means on the basis of sea hydrobionts. We are confident that they will offer the Russians more effective health product, dietary SUPPLEMENTS and medicine.